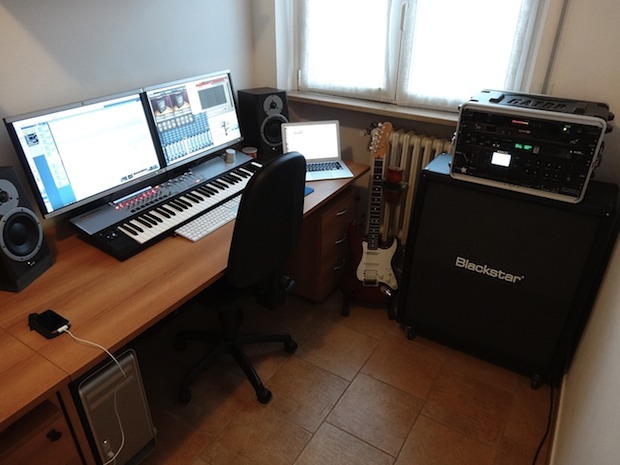 On the software side of things, Luca uses Cubase 5, Halion 4, Guitar Rig 5, and other VST’s. These production setups are a great argument in support of the Mac Pro line, which we all hope will be revived as a professional workhorse again soon. Now, I’ll be the first to admit that I don’t know the slightest thing about music let alone how to go about making anything with a rhythm, but I do know a sweet Mac setup when I see one and this definitely fit’s the description, what do you think? This is like a dream workstation for me, still working on to build something like this. Great desk set up, workstations like these remind me of how important it is for there to be hardware available to the power user because that MacBook Air alone isn’t going to cut it. Even if it’s a smaller subset of the market, it is what people build from. If Apple is to abandon the professional creative classes by leaving behind the Mac Pro, we will end up leaving the platform as a whole out of necessity. Sorry Apple, a dinky iPad 4 with a single tasking OS, toy apps, no meaningful IO interfaces, and the performance of a 2001 Pentium isn’t going to cut it beyond Grandma and Grandpa sending an email or two. And guess what, power hardware is required to build for their very iOS platforms they care so much about! Do you think someone is developing an iOS app on an iPad? Get real, those toys are auxiliary to creation but no one serious uses them as a creation platform. I sure hope Apple doesn’t abandon us. The Mac Pro situation feels like they already did though. As you can see, I am a frustrated pro user. According to Macrumors Apple have told retailers that a new Mac Pro will launch this spring!!! And understand how you feel. It might have seen like Mac have forgotten the people demanding REAL power from a stationary Mac! ..but Apple gave you the software? Would the macbook air be damaged sitting in front of a speaker by the bass causing vibration? Also, would the speaker magnets interfere or damage the macbook air? killer setup… I’ve seen that live and is plenty powerful for every task a geek can dream of! The room is very narrow. What type of room is it? A bedroom? I never saw a room that narrow. Looks like a jail cell, lol. The setup is beautiful though. Very nice. I understand that but what type of room is it meant to be? Is it a small bedroom? It can’t be a living room or a dining room. Not a kitchen or bathroom. I am just curious to know what type of room that was meant to be by the people who built it. I am in the New York where rooms can be small but I have not seen one that narrow. Where are you located? I’m more partial to the Gibson Les Paul ;-) (although it and the Strat are not interchangeable and have their sounds and uses). Also, I’d swap out the Guitar Rig 5 with Overloud’s TH2. Mmmm … I didn’t know the Overloud’s TH2 … I’ll try it ! Looks lovely but the owner has zero knowledge of acoustics, unless they have some serious room correction software they could replace those excellent Dynaudio speakers with crappy hifi speakers for all the good they’ll do in that space… for an absolute start the speakers should be pointing down the longest aspect of the room, away from the wall, on stands, with nothing in front of them… the music produced here will only sound good in that room. Please – if you’re going to invest in hardware, spend some time to do some research and invest in a little knowledge also. Failing that – stick to some expensive headphones.